Holiday time is the time to work hard and play hard! A busy lifestyle may cause one to skip moisturizing the feet, but it can get quite rough down there. Introducing Hydra Re-new Foot Mask from Bandi foot-care Collection. It contains glycerin, beta glucan, fruit extracts, shea butter and tea tree essence and more. This treatment mask can maintain skin elasticity and let your feet feel refreshing. Here I will test one of the masks on a pedicured foot, and the other mask on the untreated foot. While the pedicured one already soft and smooth. First, both feet are being cleaned. Then Bandi Hydra Re-new Foot Masks were left on for 15 minutes. After removing the masks, The skin on thepreviously untreated foot has become fair, smooth than regain it’s’ elasticity. On the pedicured one, the skin is supple and glowing. Itlooks even brighter then the other foot. All the finelines has disappeared. My feet felt surprisingly non-sticky and refreshing. I went on to massage the remaining essence on my feet and they were quickly absorbed. I recommend to get a a pedicure beforehand. 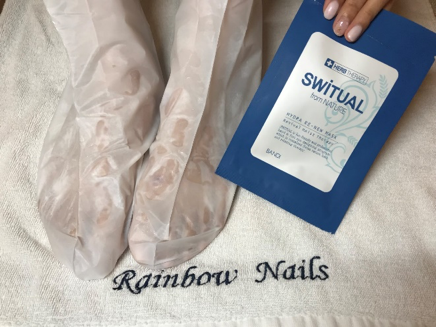 This mask can enhance the result of the pedicure and make it last longer.